IF I WANT TO BE ALONE, SOME PLACE I CAN WRITE, I CAN READ, I CAN PRAY, I CAN CRY, I CAN DO WHATEVER I WANT – I GO TO THE BATHROOM. Alicia Keys. SORROW CAN BE ALLEVIATED BY GOOD SLEEP, A BATH AND A GLASS OF WINE. Thomas Aquinas. In all areas of life – and in the home – there are spheres of intimacy: there are some spaces into which we happily invite others and some which we share with only those close to us. And then there are those spaces which we keep completely to ourselves. The bathroom is one such place. To me, the bathroom is a place where I can be completely myself. It is a space to be alone and undisturbed and it is a place to gather my thoughts and to prepare for the day ahead or to reflect on the day past. I love a good soak in the bath with a glass of wine and a book or magazine – it is the perfect way to unwind after a stressful or demanding week. The bathroom in my flat is really quite small and, being in a complex of flats, it has no window. When I moved in, it was decorated in neutral tones: wooden laminate flooring, white walls and a white suite with cream/copper tiles. It looked very modern and generic and didn’t really feel ‘homely’ to me. I always really like bathrooms which have a coastal feel; I absolutely love the beach and regret not living closer to the coast. So, whilst I haven’t got round to repainting the walls or changing the suite or tiles, I have filled my bathroom with reminders of lazy days spent sunbathing and swimming in the sea, or of invigorating walks along the shore. The most significant of these reminders is a series of four pictures which I have collected from various places and which remind me, in particular, of the Northumberland coastline where I spent many a happy childhood summer. Two of the pictures are gorgeous greetings cards and the other two are postcards which I found on holiday one year. I’ve framed all of them using photo frames which I bought in different charity shops. These four framed pictures work well together to evoke memories of being beside the sea. This beautiful watercolour reminds me of the secluded Northumberland landscape. This watercolour is by the same artist and depicts the beautiful Northern Sea and wide open skies. This old-fashioned postcard works with the other colours in the room. This sailing boat postcard has a real sense of freedom on the open water. I’ve continued this coastal feel by using blue, turquoise, yellow and white as the main colours in my bathroom – both for decorations and towels. I bought this cute beach hut peg several years ago on holiday in Northumberland and, when I bought my flat, I thought that it would fit in with the beach style I wanted to recreate in my bathroom. 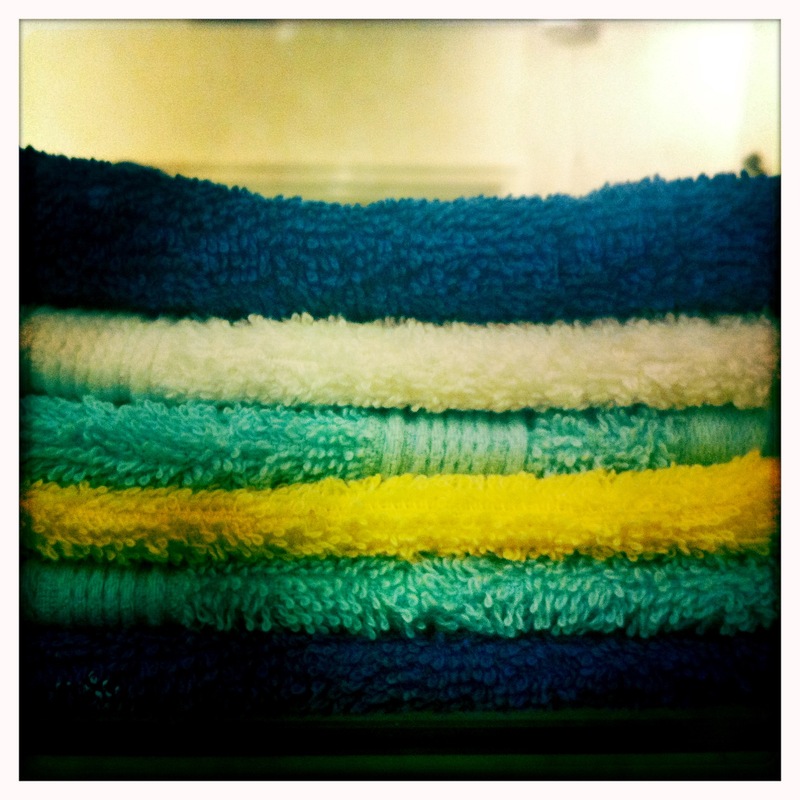 When I moved in, I was given a big set of different sized turquoise towels and face cloths. I’ve added to this by purchasing some additional blue towels and face cloths in royal blue, pure white and sandy yellow. This old-fashioned beach hut peg ties in well with the coastal feel in the bathroom. Layered flannels in royal blue, turquoise, yellow and white continue the beach theme. Nothing reminds me of the beach more than shells and whenever I am by the sea I come home with pockets full of them. I’ve put some of the smaller ones in an old tea-light holder and have displayed some of the bigger shells from my Granny on the ledge that runs around the bottom of the bathroom. I’ve also filled an old jar with blue glass sea shapes, which I was given years ago as a gift. This old tea light holder is filled with shells to recreate a coastal feel. This gorgeous hand-painted glass vase, was made by local artist Esme Howard. Find out more about her and her other lovely work here: http://clothroadartists.com/artists/esme-howard/. This stunning hand-painted glass vase is completely unique. Along with flannels in complementary colours and the tea-light holder filled with shells, the bathroom shelf also holds a beautiful vintage bowl which used to belong to my Granny. I love the old, cottage roses and the gold trim. I’ve filled it with a range of different sweet-smelling soaps and I really like the old-fashioned packaging. A gorgeous vintage bowl is repurposed as a soap dish. The different items on the Bathroom shelf work well with the vintage and coastal themes. Beneath the shelf, this small fish serving dish makes a brilliant soap dish and a Cath Kidston plastic beaker makes a pretty toothbrush holder. This quirky blue fish dish makes an unusual soap dish. A pretty plastic beaker doubles up as a toothbrush holder. A white wire basket tucked under the sink provides useful and pretty storage for a spare toilet roll and a bit of bathroom reading. The design reminds me of crabbing nets although, thankfully, the contents of this basket are more friendly! Bathroom literature: a range of modern and vintage books coupled with current clothes’ catalogues. The final echo of beach life in the bathroom comes in this cream enamel bucket, which I found in a garden centre and have used as an easy way to keep all of my toiletries together. 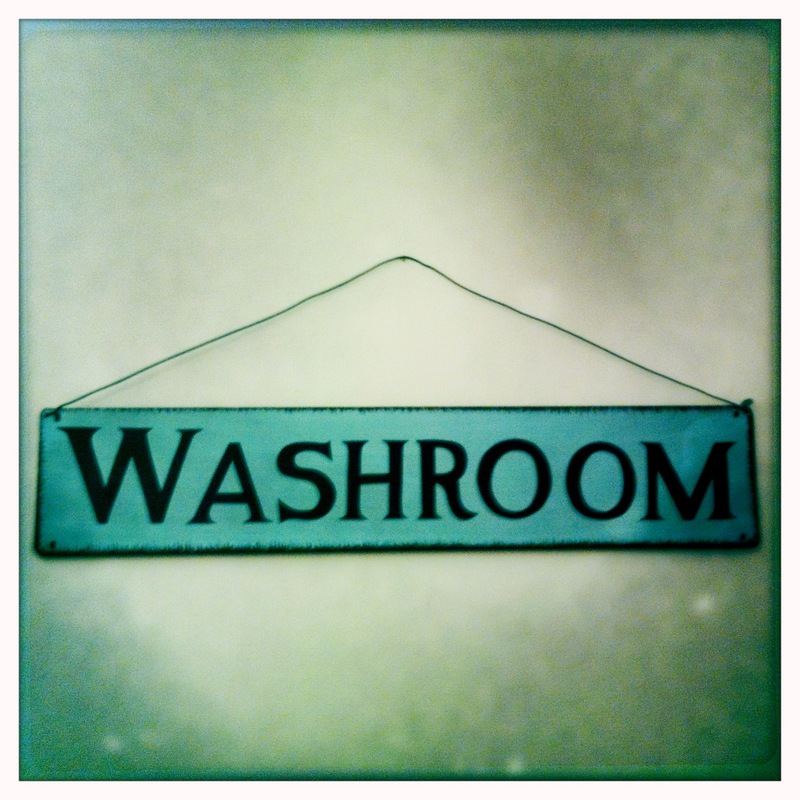 This works especially well in a bathroom with limited storage space. 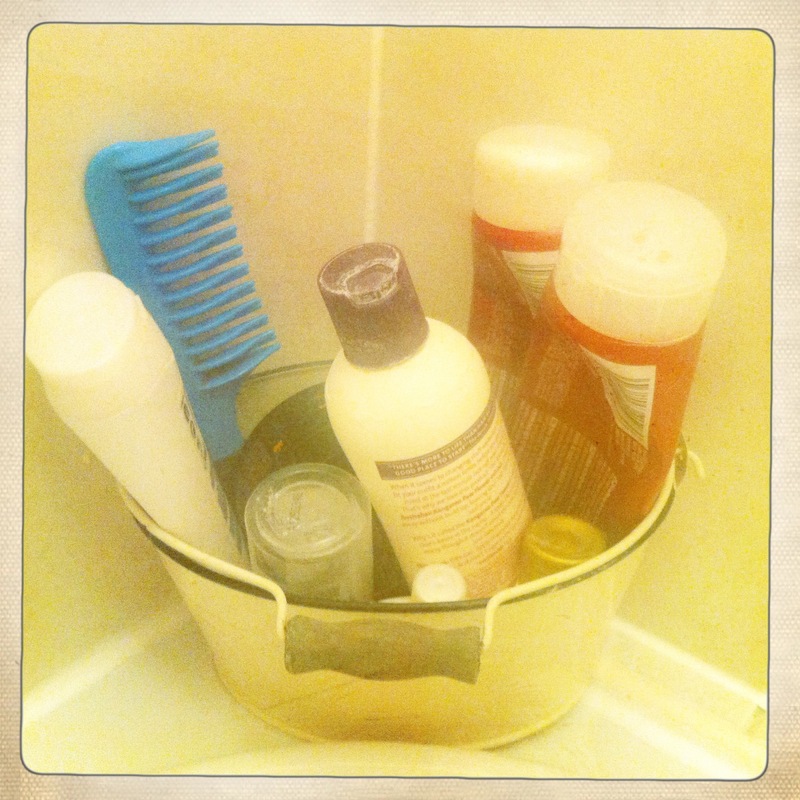 This old enamel bucket is a useful storage option for a range of toiletries.